Access is critical to the safety of building-services engineers installing and maintaining plant on roofs. But what does this mean in practice? John Grenville of ECEX explains. Inexcusable negligence by unenlightened managers can lead to horrific incidents that blight the lives of a hard-working people. It can also trash the reputation of the company that employs them and result in a fine and costs of several thousands of pounds. That’s why it pays to take health and safety seriously. But this does not simply mean the obvious safety and welfare issues such as making sure staff have the right PPE (personal protective equipment), it also means providing safe access in tight or difficult-to-reach areas on roofs where the main dangers are slips, trips and falls from height. • risks from fragile surfaces and falling objects are properly controlled. In 2012/13, falls from height were the most common cause of workplace deaths, accounting for almost a third (31%) of fatal injuries to workers. In other words, 46 deaths involved people falling from height. But an employer’s duties don’t end with this all-embracing law. Beyond general duties to protect the welfare of people at work, and others who might be affected by their business, the Work at Height Regulations 2005 (as amended) set out specific safety and health requirements for working at height (see the panel ‘Higher intelligence’). The regulations also contain schedules which lay down more specific requirements for places of work and means of access for work at height, fall prevention and fall protection, working platforms, scaffolding and ladders. All plant and equipment — including HVAC machinery located on the roof — needs to be effectively maintained. Doing this safely depends on the skills of the maintainer, the environment in which work takes place and whether maintenance happens in a structured way, or as a knee-jerk reaction to sudden-onset problems. Access is crucial to mitigating the risks of working at height and there are various solutions on offer to help with this (see the panel ‘Access to work). The specialist equipment available to make accessing plant easier, as well as speeding up maintenance tasks while improving system efficiency, is usually constructed from fabricated steel. But beware — whichever company you choose to do this, it is absolutely crucial that you ensure they employ skilled metalwork fabricators with their own workshop, and that the company complies with EN1090, a standard that regulates the fabrication and assembly of steel and aluminium structures. There are many solutions to improve access and safety to those maintaining HVAC equipment on roofs. ECEX, for example, provides easy, cost-effective access solutions which eliminate trip hazards on the roof and internal plantrooms, as well as preventing falls from height. These include the following. • Step-overs to pipework, ductwork and other obstructions. 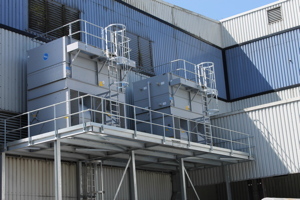 • Bespoke walkways and access gantries to cooling towers, chillers and AHUs. • Bespoke platforms and railings. • Free-standing edge protection to avoid roof penetration. • Tubular-steel guard railing fixed to roof surface or parapet wall. • Toe boards and kick plates. • Access ladders, hooped ladders and staircases. • Gantries, platforms and walkways. • EN 1090-1: Requirements for conformity assessment for structural components (CE-Marking). • EN 1090-2: Technical requirements for the execution of steel structures. • EN 1090-3: Technical requirements for the execution of aluminium structures. Meeting these requirements takes a great deal of understanding and considerable investment (see link below for more details). But, should you fail to employ a competent, properly resourced and well-prepared company to supply and install your access platforms etc, you will leave yourself open to fines, your company’s standing will be negatively affected and, most importantly, you won’t be protecting your staff adequately. To safeguard employees who work at height in areas that are difficult to reach — as well as to comply with the law — it pays to employ a well-established, reputable, expert multi-specialist engineering contractor able to offer a wide range of access safety and metalwork, and bespoke fabrication. John Grenville is managing director of ECEX.